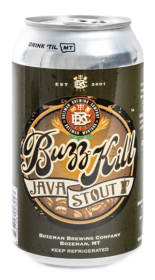 BuzzKill Java Stout is an American beer, it has an alcohol content of 6.2%. This robust stout comprised of six different malts is cold steeped with Rockford Coffee’s Dark House Blend. The result: a delightful BUZZ we have all come to love. This stout is coffee, this coffee is stout.